Do you like straight ahead swinging, shuffling Blue Note era jazz? – have you heard of Jimmy Smith, Captain Jack Mcduff or Stanley Turrentine? Have you heard drummer Donald Bailey play the shuffle feel? Well folks, we are not here to copy anyone, but Shuffle was born out of love! That's right! – Love of the music of the masters in the classic 50s and 60s Organ, Saxophone, Drums, Guitar Quartet. 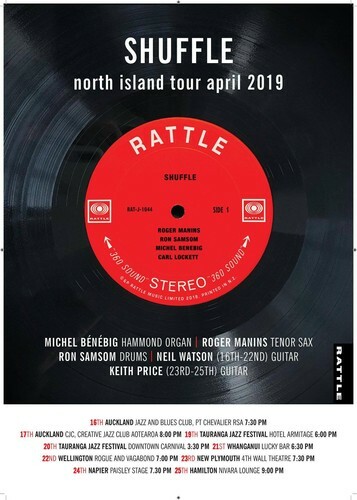 We will present new material from our CD Shuffle which features Ron Samsom, Michel Benebig, Roger Manins and one of the USA's greatest Jazz guitarists ever, Mr Carl Lockett. For this tour Mr Lockett cannot join us, but don't worry! We have two of the finest and greatest guitarists currently in NZ to join us, both with very big feet! !- The amazing and super creative Mr Neil Watson, and direct from Canada, to play his first gigs in first gigs ever on New Zealand soil, the amazing Mr Keith Price! You gotta be happy with that!! Come along and have a great time! "Sometimes an album blows straight into your heart like a warm breeze off the summer ocean. ‘Shuffle’ is exactly that album. There is an easy-going familiarity to it and you instantly feel good as your body connects with the rhythms. Shuffle achieves that rare feat of sounding both new and familiar. This is the sound that I grew to love many years ago, as practitioners like Jimmy Smith, Big John Patton, Gene Ammons, and Brother Jack McDuff fused Soul and Jazz into a rare amalgam. To appreciate this music you need no acclimatisation; no understanding of Jazz. To appreciate this music you only need one prerequisite, a human heart. It’s ‘groove’, it is sensual and it’s my guilty pleasure."